The following is one of the most famous of Harry Anslinger’s Gore file cases – It (as can be seen) is also one of this most brutal ones. That I fully appreciate the need for action, you may judge from the fact that last January I tried a murder case for several days, of a particularly brutal character in which one colored young man killed another, literally smashing his face and head to a pulp, as the enclosed photograph demonstrates. One of the defenses was that the defendant's intellect was so prostrated from his smoking marihuana cigarettes that he did not know what he was doing. The defendant was found guilty and sentenced to a long term of years. I am convinced that marihuana had been indulged in, that the smoking had occurred, and the brutality of the murder was accounted for by the narcotic, though the defendant's intellect had not been totally prostrate, so the verdict was legally correct. It seems to me that this instance might be of value to you in your campaign. Mr. Hartshorne is a member of the Interstate Commission on Crime. We have many cases of this kind. Senator Brown: It affects them that way? Senator Davis: (viewing a photograph presented by Mr. Anslinger) Was there in this case a blood or skin disease caused by marihuana? 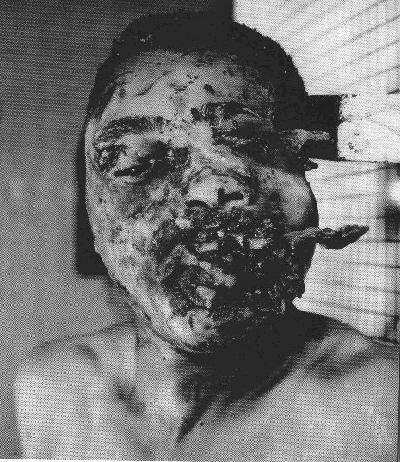 Mr. Anslinger: No; this is a photograph of the murdered man, Senator. It shows the fury of the murderer. Senator Brown: That is terrible. MUSEUM NOTE: While doing research on this case, we of course tracked down as much (publicly available) information about Judge Hartshorne as possible. From all sources it appears that he was indeed an honest and hard working judge. One who really believed that Medical Cannabis was the devils weed etc. History of course now views him as a victim (of the hysteria campaign) victimizing other victims. But still it does appear that he was sincere in his actions. Richard Hartshorne (February 29, 1888 – September 14, 1975) was a United States federal judge. Born in Newark, New Jersey, Hartshorne received a Litt.B. from Princeton University in 1909 and an LL.B. from Columbia Law School in 1912. He was in private practice in New Jersey from 1912 to 1931. U.S. Naval Reserve Lieutenant, J.G., World War I. He was a Special assistant to U.S. attorney of District of New Jersey in 1925. He was a judge on the County Court, Newark, New Jersey from 1931 to 1951. He was a President, New Jersey Interstate Commission on Crime from 1935 to 1943. Hartshorne was a federal judge on the United States District Court for the District of New Jersey. Hartshorne was nominated by President Harry S. Truman on October 17, 1951, to a seat vacated by Guy L. Fake. He was confirmed by the United States Senate on October 19, 1951, and received his commission on October 20, 1951. He assumed senior status on October 29, 1961. Hartshorne served in that capacity until September 14, 1975, due to his death. For quite some time, due to numerous factors, we were not able to locate very much information of this case. No who, what, where, when. Then someone did the logical thing and simply contacted the State Library over there. ". . The trial of Archie Farrell began about January 12, 1937. The verdict was reported in the newspaper on January 16, 1937. I found two brief articles in the Newark Evening News on those dates. If you send me your full mailing address and telephone number, I can send you copies of the two articles. The cost would be $10.00 payable when you receive the invoice. I will send the articles today. The invoice will follow later. The only reference to marihuana is the following statement from the second article which actually reported the verdicts for two separate trials. "All three defendants said they had smoked 'reefer' (narcotic) cigarettes and were not responsible for their actions." 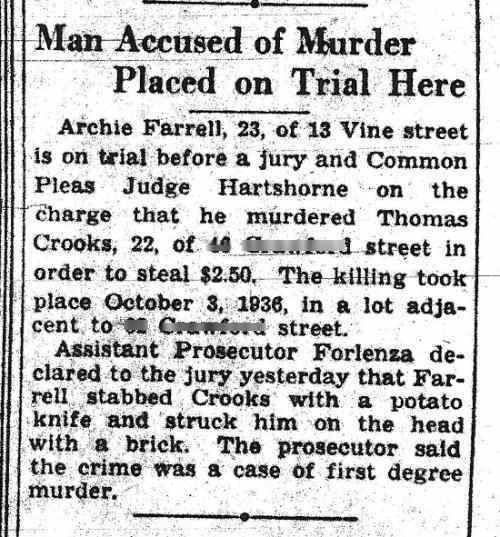 Archie Farrell, 23, of 13 Vine Street is on trail before a jury and Common Pleas Judge Hartshorne on the charge that he murdered Thomas Crooks, 22, of [censored] street in order to steal $2.50. The killing took place October 3, 1936, in a lot adjacent to [censored] street. Assistant Prosecutor Forlenza declared to the jury yesterday that Farrell stabbed Crooks with a potato knife and struck him on the head with a brick. The prosecutor said the crime was a case of first degree murder. Three youths for whom the state demanded the death penalty in murder trials escaped the electric chair last night. . . . Archie Farrell, 23. Of 13 Vine street was found guilty of murder in the second degree by a jury before Common pleas Judge Hartahorne. . . . . The jury trying Farrell sought to learn what constitutes premeditation in relation to intoxication. Judge Hartshorne said that when the defendant was too intoxicated to form an intent to commit a crime there could be no premeditation, the essential ingredient for first degree murder. All three defendants said they had smoked “reefer” (narcotic) cigarettes and were not responsible for their actions. . . . . In the defenses of both Brown and Farrell it was declared alleged confession had been given under duress. Crooks was found dead in a vacant lot. He had been last seen with Farrell going to buy grapes. Farrell’s counsel, Edward Fenias, maintained there was no evidence to connect Farrell with the crime.